The Central Housing and Planning Authority (CH&PA) under the banner of the Ministry of Communities is pulling out all stops towards the regularization of Guyana’s Housing sector and that includes going after persons who would have defaulted on their land allocation. 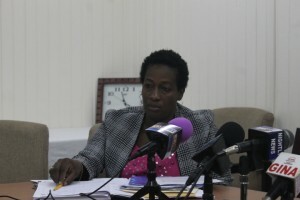 Junior Communities Minister Valerie Patterson at a press conference on Monday was adamant that no effort would be spared to go after persons that defaulted on their lands since the Authority is processing some 25,000 applications and does not have enough developed land to satisfy that need. According to the Minister, despite the known fact that persons cannot sell allocate house lots less than ten years after acquisition, persons are still attempting to do so. She explained that some persons would have bought house lots in bulk quantity under the former administration and is now attempting to sell the said house lots to private developers. “All around the country we have found that persons having been allocated house lots they are selling house lots for gain. This is illegal. Our policy says you cannot sell within ten years,” said Patterson. However, this is not the only problem facing the Ministry. Housing Official Denise Tudor explained that thousands of persons would have been allocated house lots and would not have occupied the lands. Hence the government will also be taking steps to repossess these types of lands. She explained that in some cases persons have been allocated the house lots for more than 18 months but have not taken up the lands. 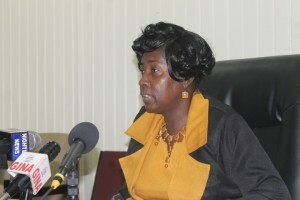 Patterson later explained that persons who would have been given lands in undeveloped areas would not be affected as the Authority understands their situation. But for the others it will not be the same.